One of my regular duties as an English teaching assistant was teaching weekly arts plastiques lessons for CP and CE1 (1st and 2nd grade). Their teacher occasionally came up with ideas, but she wasn’t very crafty (her words), so most weeks she left it up to me. Going off of various topics they were working on in other subjects, I came up with a number of fun crafts that we used to decorate the classroom, the hallways, and a few that they got to take home as well :). I also have a small amount of art activities I did in my preschool classes, which they loved! It took me a while to figure out how to do these kinds of lessons well, but I’m so glad I persevered, because doing a craft is so much more rewarding than just reciting vocabulary. It was sometimes tough, because the school (and I don’t think mine is an outlier in this) did not have the type of resources I am used to in American school art classes. I tried to use the available resources (mostly an assortment of colored paper scraps, some oil pastels, markers, colored pencils, glue, and a little bit of tempera paint) responsibly, because frankly, I wasn’t sure if they would be getting new ones the following year or not! I encourage you to talk with your colleagues and the directeur/trice to make sure you’re not over-using precious resources. This was my colleague’s idea, but I led the charge in terms of the actual creation of each mural. I cut out three giant trees out of recycled paper to hang in the hallways. 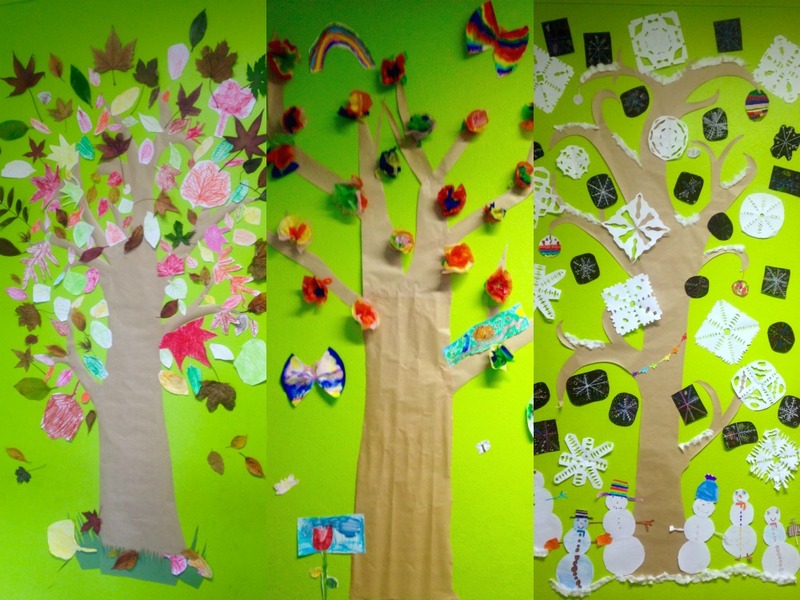 Throughout the year, we decorated the trees to represent the three different seasons. We talked about what colors would go with each season (red, orange, brown for fall; blue and white for winter; etc) and what features we could add. Everything is attached to the walls with pâte à fixe (sticky tack). I did this activity on my last week in the preschool, as a cute wrap up. I also used Count to Sleep for this lesson. After, we talked about the colors in the American flag and I gave each child a star to decorate and add on!! I created the flag poster in advance, so all we had to do in class was the stars. We made hand turkeys for Thanksgiving, decorated hearts for Valentine’s Day and colored in bunnies for Easter! This was one of my most favorite lessons that I planned the entire year because of all the creativity the kids showed drawing their Leprechauns! After a brief mini-lesson about St. Patrick’s Day, I gave every pair two dice. After each roll, they had to add on a new feature to their Leprechauns depending on what number they got. This was the brainchild of my colleague and requires a certain amount of preparation, so make sure you coordinate with your school if you want to try this. She brought in two white sheets, on which I sketched out the UK and American flags. Then in groups, the students added their handprints in red, white, and blue tempera paint! We actually had two or three parent volunteers come in for this to help with crowd control so we didn’t end up with paint everywhere! We had such a blast making these giant flags!! 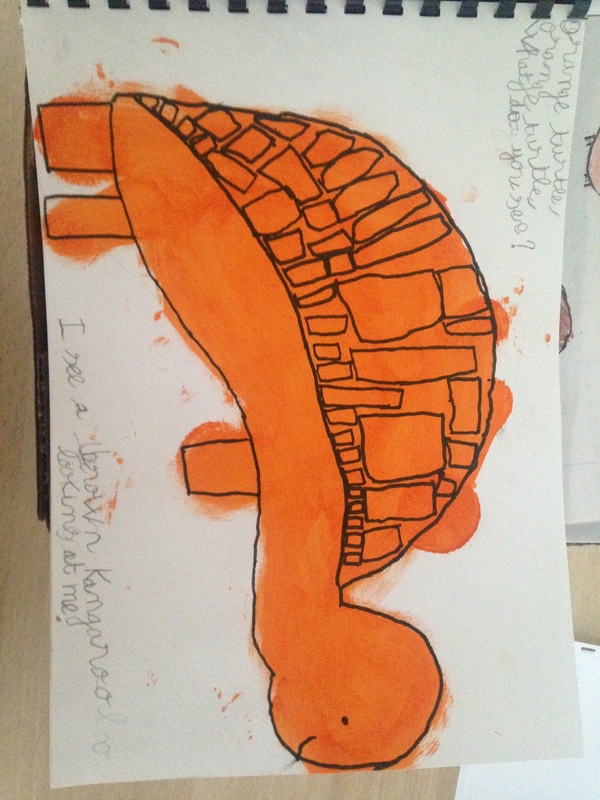 We made our own book based on Eric Carle’s Brown Bear Brown Bear, What Do You See? It’s repetetive structure is great for young learners, and it’s a great way to practice colors and animals. This is a bit of a long-term project, so don’t plan to finish the entire thing in just one class. Another assistant I know did something similar with the book Ketchup on your Cornflakes. The possibilities are endless! I did this for Valentine’s Day vocab, but it can easily be modified for any subject. You just need to create a document with a title page and six vocab words with pictures. Print them double sided, cut, fold, and staple! 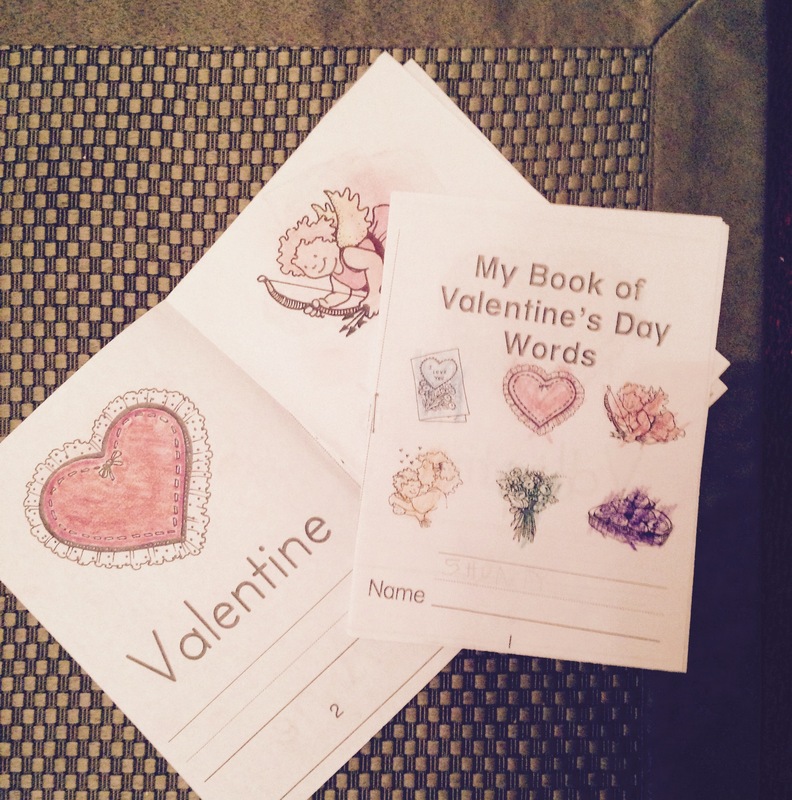 I made these with my preschoolers, so I cut and folded in advance, which was a lot of leg work, but….I mean you only work 12 hours. Kids get to color their books, and you can even leave space for the kids to recopy the vocabulary underneath the images. This was something my colleague had their classes do each week, but I loved the idea so much, that I still want to share it! She had a class “Monster Book” that one child took home each week. 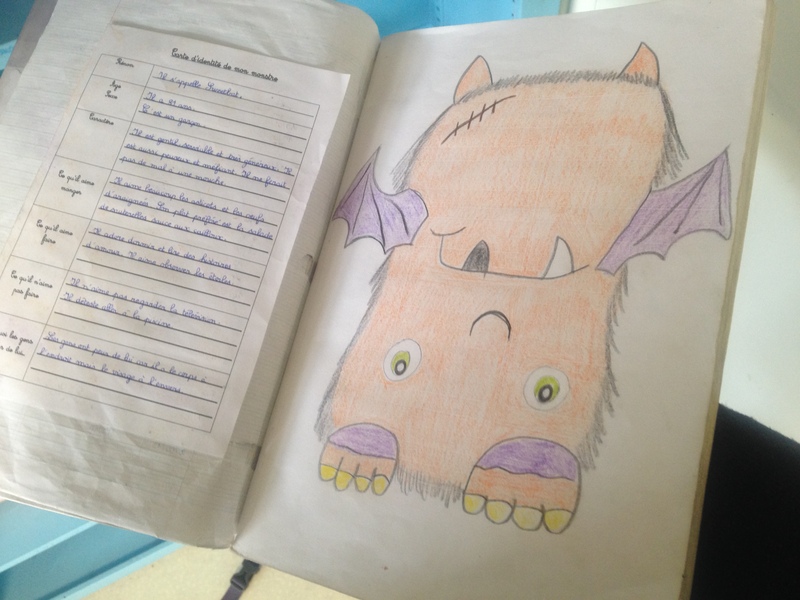 They had to draw a monster, and then answer various questions about it in English! Things like What does the monster eat? What does the monster like to do? What color is the monster? etc. When in doubt, print off some coloring pages!!! You can play a bingo-type game with coloring (color the hand, color the elephant), label the pages with your vocab, or just let them have fun! I highly recommend Activity Village for awesome coloring pages for any theme you could possibly imagine! SO INTERESTING! YOU HAVE SUCH GREAT IDEAS. Wow, these are great! Bet your kids have so much fun doing these craft projects!